Pedometers, Libraries and, Um…Something Else…What Was It??? 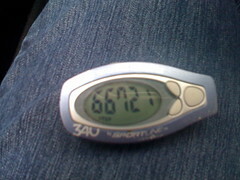 I believe I mentioned something about a pedometer. And walking 10,000 steps every day. I’m getting there. It is a work in progress. I bought the pedometer…I swear! It is indeed in my possession. I didn’t even go for the cheapest on as I usually would…I bought a fancy-schmancy one that does a bunch of cool stuff. But one of those things is entering your weight. And the default weight it starts at is 50 pounds. What? Really? Are they marketing these to elementary school children now? Do they have any idea how long I have to sit there and hold down that stupid button to enter my info? Oh my. Should have gone for the $9 one. But seriously, it is really cool! It has a function for going back and forth between walking and running. Because I have aspirations, guys. No marathons. Absolutely not. I hate running; I just want to be able to say I can run more than 10 feet with out collapsing in a coma brought on by oxygen deprivation (<–note the drama queen-like exaggeration). After a day of not bothering to set it up, I did so about noon today. I put it on and went out for a brisk walk in the -5 degree sunshine. 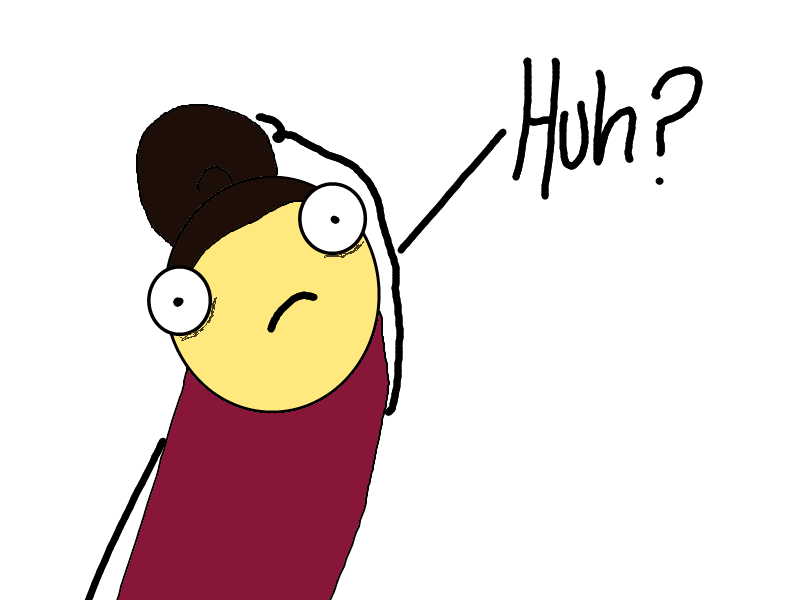 I intended to walk for an hour at least but gave up after 40 minutes because, you know…-5!!!! I wore the pedometer for the rest of the afternoon and was really upset after checking it at one point and finding I was only 4% to my goal. That is when I discovered I had set my goal on the pedometer for 100,000 steps. I know we should always aim to set the bar high but uh…yeah…gotta fix that. Anyway, it was a rude awakening to not reach the goal today. I used to be able to rack up anywhere from 12,000 to 14,000 steps per day…without going for a walk. That was just how much I was moving in my regular daily routine. Now, I don’t have very much to occupy my time, so, I am moving far less and have to go out of my way to get the extra activity. So, tomorrow, I will wear the pedometer as soon as I get up and see how much better I can do at my challenge! Of course, I might wait until after I do my morning workout, you know, just in case I reach the 100,000 steps by accident from jumping around so much. So after my walking around today, I ended up at the library. I know, I know, you are all thinking, “What? All that and she is an intellectual too?! Amazing!” [insert slow clap here] While sitting and reading some books – and they weren’t even picture books! – I suddenly realized that as intellectual as I was trying to be, I somehow was stupid busy enough to forget to have lunch. [insert face palm here] As you may imagine, I was absolutely staaarrrrrving after a couple of hours hitting the books (not literally, that would just be weird). With my ravenous hunger and knowing I still had a TON of points left available, I came dangerously close to ordering a pizza…and I could have, without any trouble points-wise. Then I remembered that would mean leftover pizza. So, as much as that treat would have been great today, I just couldn’t live with the thought of continuing to eat it over the next few days. I managed to fill up on healthier goodness in my kitchen and was much happier with what I ate, even if it wasn’t quite as much as I should have had. Stupid lunch-forgetter! I did have lunch out yesterday. It was good. Smoked salmon and spinach with pasta. I followed the tips from WW and asked for a take-away box when I ordered (you know, to put half of your meal in the box straightaway so you don’t eat it all). I did feel odd doing that and felt guilty that I didn’t apologize for what the server must have thought was weird, hippy psychic madness, knowing that I would be taking food home before I even got my food! As soon as my meal arrived, I put more than half in the box so that I was left with more healthy than carby on my plate. I gave what I boxed up, to my husband when I got home. He was thrilled and is extremely grateful to WW for such tips, because most times that I am out with friends but not him, he gets, as a consolation prize, what I bring home. There really isn’t a world outside the demands of his stomach, as far as he is concerned. Best guy to bring to a potluck party; no one has to worry about lugging home any leftovers! Hahaha! 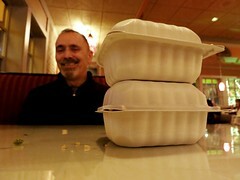 A little too eager, he put ALL his lunch in the take-away boxes. So smug about it too. Yeah, you’re going to be hungry in about five minutes. Trust me, I would know. Well, onward and upward…er, downward, since we are talking about inches and pounds!